I know it doesn’t look like much on a hanger but this is my tried and true super simple, super fast draw string skirt. I used New Look 6494 for the pattern and added a 2″ border on the bottom. 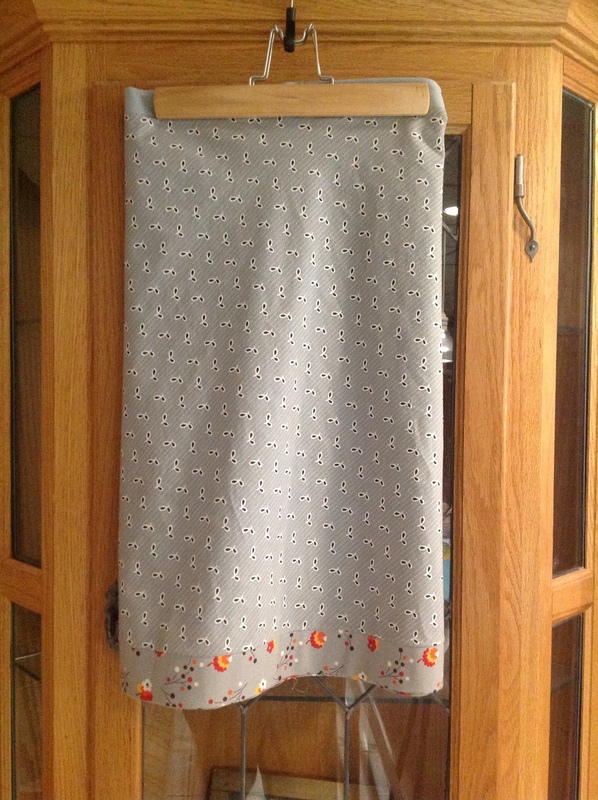 For the main skirt piece, I used Flea Market Fancy Eyelet in Grey and for the border, Posie in grey. I thought about appliqueing a big raw edged flower off centre but changed my mind and kept this one simple and formal enough to wear to work. I’d like to make a patch work skirt as well, perhaps using Granny Squares blocks? I love how these are turning out and completely understand the fasination that’s going on with them right now. Yesterday was a huge traffic day here at Bending Pins, being featured in Craftsy’s Newsletter gave me a huge boost but many were looking for a tutorial on my Japanese Linen iPad case. Sadly I didn’t have one prepared because I didn’t know it was going to become so popular! I worked on a tutorial all day yesterday but wasn’t able to get it finished. I will endeavor to get one done for next Sunday since it’ll be a long weekend, YAY!! Almost forgot, I’m linking up with Manic Monday today! This entry was posted in Fabric, iPad, New Look and tagged Flea Market Fancy, Japanese Linen by Tabatha. Bookmark the permalink. I love the fabric you picked for your granny square block ! 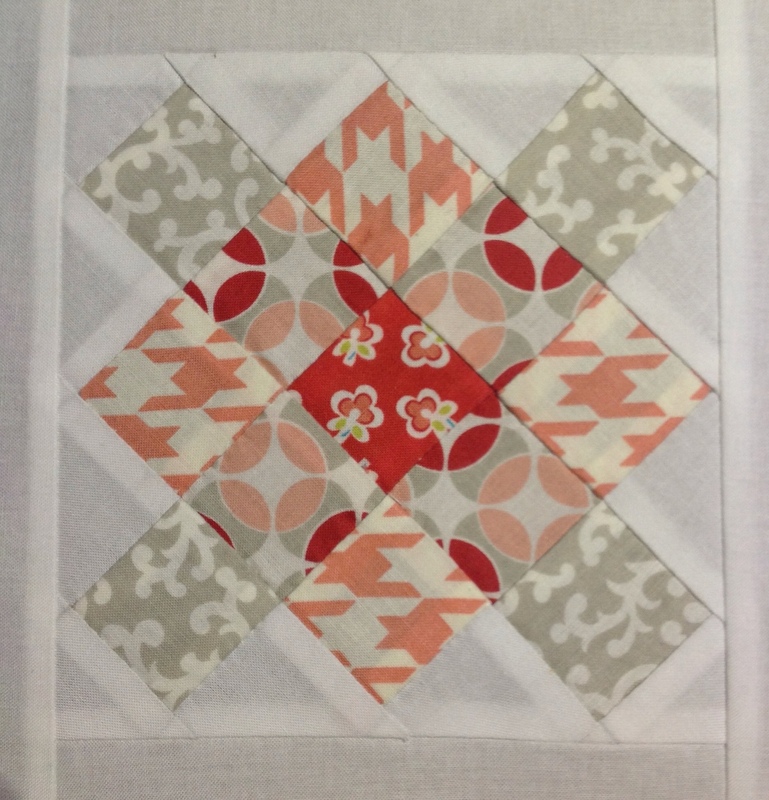 Are you planning on making a whole quilt ? I love that fabric too, it’s Vintage Modern by Bonnie and Camille. I wasn’t planning an entire granny square quilt but you never know! I love the look of your skirt and what could be more perfect than a patchwork skirt, are you really going to make one? Absolutely Amanda, I think a patchwork skirt would be awesome, you could stare at your favorite fabrics all day long! I’ll work on it this weekend! Cute skirt! I’m a little disappointed you didn’t model it in person though. 😉 Love those granny square blocks. Love the skirt and the granny block ! I saw a girl at my grandson’s preschool who has a patchwork skirt out of charm packs ; her grandma made it I found out after asking !! it’s cute !! I’m sure I’m not the first or last to make a pieced/quilted skirt, I think I remember seeing pieced maxi skirts in the 70’s, I’ll have to try one. Mine is almost finished, will post again Sunday! Thanks for dropping by Mickey! Congrats on the Craftsy profile, Tabatha! I LOVE your skirt and that block. Great colour palette! Thank MR! I’m glad you like my skirt and block, you should give that skirt a try, it’s a blast when you mix in piecing/quilting! Go for it! That skirt pattern is so quick and easy, you’ll want to make a dozen skirts!